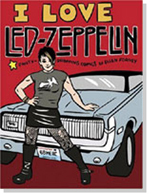 In advance of the annual Comic-Con extravaganza, Salon's comics critic highlights this summer's most exciting graphic novels. It's July, the month when the comics industry floods stores with big releases in anticipation of Comic-Con International, the mind-destroying pop culture explosion that takes over San Diego from the 19th to the 23rd. So in lieu of the usual long review, here's a quick once-over of a handful of worthwhile new books. 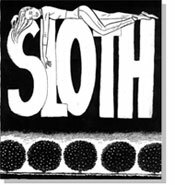 Gilbert Hernandez's "Sloth" (Vertigo) is one of the oddest graphic novels of the "Love & Rockets" co-creator's 25-year career, and that's saying something. It's an unnerving little fable with no moral, a mood piece whose plot only begins to cohere on repeated readings and mostly relies on dream logic anyway. The setup is that Miguel Serra, a teenage garage-rock musician who's just woken up from a yearlong coma that he apparently willed himself into and back out of, discovers that he moves more slowly than the rest of the world now, and starts to investigate the long-ago disappearance of his mother, which seems to have something to do with a lemon grove haunted by a goat-man. Midway through the story, though, there's a major twist that reverses a lot of what we know about most of the characters; I won't spoil it except to say that Hernandez has used a very similar idea before, in his triple-X-rated early-'90s graphic novel "Birdland." What really makes "Sloth" haunting, though, is Hernandez's artwork. In his other books (including his previous graphic novel, "Luba: The Book of Ofelia," published only a few months ago), he's usually gotten over on his mastery of exaggeratedly "cartoony" facial expressions and body language, and his gift for finding individual images that encapsulate an entire scene. For this book, though, he's developed a new drawing style, built around patterns and textures made by meticulous stippling and compulsively repeated brush strokes. Every page has its own dominant visual motif, a way of suggesting shade and depth that alters the story's tone and pacing -- sometimes it's even echoed in the design on the hat that one character wears. And every image in the book's second half seems a little too orderly in the way that bad dreams do, doubling back to symbols and scenarios we've already seen and thought we understood, as the story's patterns and repetitions loop in on themselves. Megan Kelso isn't exactly a minimalist -- her drawings and stories are too complicated and evocative for that. It's fairer to say that she's devoted to the power of understatement: clear lines with no shading, muted colors, silences as carefully measured as her words. 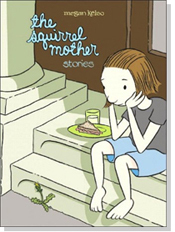 "The Squirrel Mother" (Fantagraphics) collects 14 of her brief pieces, many of them set in the private world of girls and women. We see her characters learning to dance, trying on clothes, polishing a pickle fork, observing their surroundings, wondering what they can become and what doors are already closed forever to them. Other stories here are more explicitly political, including three about Alexander Hamilton that all use the same color palette -- "Publius" is a historical sketch about Alexander Hamilton and James Madison's collaboration on the Federalist Papers that abruptly, slyly veers into a gentle fantasy about the two of them making out. One advantage of Kelso's restrained tone is that she can turn up the emotional force much higher with very subtle gestures. The title story is composed of 12 little panels about a squirrel abandoning her children, and 12 larger panels about a human family: By its end, an image of a woman snipping a piece of fabric feels staggeringly brutal. "Meow Face" is a half-whimsical anecdote about a character's aunt locking her out of the house, but its subtext is a bitter indictment of the way the distance between glamour and reality can destroy people's lives. And the final piece in the book is a perfectly composed three-pager called "Green River": nine sentences about Gary Ridgway, the Green River Killer who murdered dozens of young women in Seattle in the '80s, a series of nature drawings of places where their bodies were found, and a sequence of panels about a teenage girl -- maybe Kelso -- working at a burger stand and selling a man who might've been Ridgway a meal. The final caption: "Now I'm thirty-six and live in New York City. I surprised myself by wanting to see him hang." 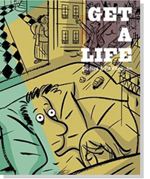 Two mid-'90s books by the French cartooning team Philippe Dupuy and Charles Berberian have just appeared for the first time in English: "Get a Life" and "Maybe Later" (both from Drawn & Quarterly). The former, published in color, is a collection of the first three French books they published about their character Monsieur Jean. He's a minor literary figure and translator, leading the bohemian life of a bachelor in Paris. As the book progresses, he's slowly realizing that he's getting to the age when living in a crappy apartment and never being able to sustain a relationship isn't as much fun as it used to be, and the not-so-bohemian life his friends are turning to is looking a lot more attractive. (He has a recurring nightmare, or fantasy, of a castle of bachelors besieged by an army of women who keep throwing babies at them.) Eventually, he finds himself taking care of a friend's kid, fumbling at domesticity and thinking about letting down his own "drawbridge." 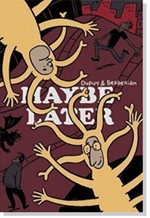 "Maybe Later," on the other hand, is a black-and-white volume, with individual stories written and drawn separately by Dupuy and Berberian, who each document the process of creating their "Women and Children First" (which became the final third of "Get a Life"). Berberian imagines himself as Robin to Dupuy's Batman, and Dupuy imagines Berberian humiliating him by being far more productive, but not much of "Maybe Later" is actually about their collaboration; instead, it's about the way the creators' lives leak into their art and vice versa. 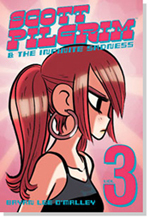 The characters in both books are drawn in the same broad, curvy, big-nosed style, which makes them blend together even more, to the artists' dismay. At one point, Monsieur Jean turns up to sarcastically thank Dupuy for setting him up with a romantic near-miss in one of their stories: "Nice little bit of fiction ... or was it a slice of life?" "I don't know," Dupuy snaps back. "Ask Charles!" Forney's line work is so graceful, bold and supple it's hard not to feel like you're ogling it. Only a few stories here are entirely her own, including two marvelous, wordless pieces about bodies in motion -- one about a woman trying to focus her mind on her yoga practice (with limited success), the other a study of a solo trapeze routine -- and a strip about how her failed attempt to collaborate with Camille Paglia turned into a failed attempt to go on a date with her. Paglia should have taken her up on something, anyway: Forney's got a rare talent for refining other people's understanding of their own experiences into comics, boiling them down to their clearest, most telling verbal and visual details. Her work is bristling with badass attitude, but every page she draws reveals her compassionate interest in other people's minds. All of this is, of course, an elaborate metaphor for the much more banal issue of dealing with a new partner's romantic history, and it's basically a soap opera with a huge cast. But instead of emo-kid navel-gazing, O'Malley throws in video game- and role playing-inspired fight scenes, delirious rock 'n' roll spectacle, and screwball dialogue. O'Malley's picked up a lot of storytelling cues from Japanese comics, and he uses them better than any other North American cartoonist -- hyperkinetic drawings with lots of zoom lines, "superdeformed" characters, even tiny explanatory captions. (One character mentions that she's spent the night at home, "scrapbooking." Caption with an arrow pointing to that word: "CRY FOR HELP.") And even though the climax of "Infinite Sadness" is, as Scott himself admits, a "last-minute, poorly-set-up deus ex machina," it's way too funny to complain about.